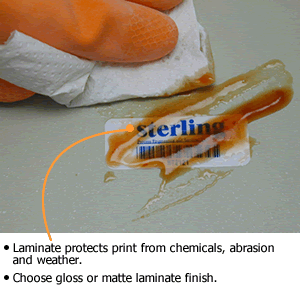 Get labels that withstand harsh chemicals and abrasion. With a durable design and a clear laminate, your barcodes and graphics are protected to ensure a long-lasting label. These barcode labels are great for wet environments and equipment used outdoors. You can be sure that your barcode will read perfectly, indoors or out. Search our plastic labels by shape. • These barcode labels are laminated for extra durability. Choose either a matte laminate or a gloss laminate. • Labels are resistant to chemicals and abrasion. Just wipe away liquids with a paper towel for easy cleanup. • It's simple to personalize your labels. Select one of our templates to add your own text, logo, and numbers. • Check out our specialized designs for Asset & Property ID Tags , Fixed Assets, Equipment and Tools. Want even more durability? Our metal barcode tags feature embedded print and an adhesive the fuses to the application surface. Select a size for your label. You will be able to select a design, change color, personalize text and specify your barcode numbering on the next page. Certain best selling sizes have a greater range of templates. Select a size for label. You will be able to select a design, change color, personalize text and specify your barcode numbers on the next page. Certain best selling sizes have a greater range of templates and materials offered. The smallest sizes are only available with 2D barcodes.